The stunning Akagera Game Lodge is not a periodic accommodation facility; it unlocks all year round and it comprises of 64 rooms and this is the only lodging facility inside the Akagera National Park borders. It is a very nice modernized hotel that less of traditional settings. 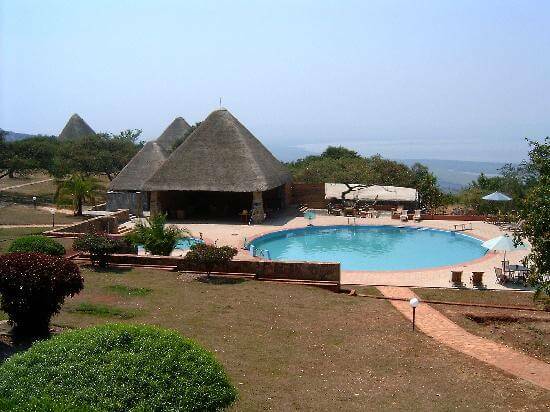 The Lodge is situated on the shores of Lake Ihema hence giving you good looking sights of lake Ihema. It has got a big and clean swimming pool that is hovering at the circumference of the extensive grassland. It also offers a fine calm heaven that is ideal for a quite gateway, a conference, as well as an uninterrupted wildlife encounter. Akagera game lodge has multiplicity of rooms that is Singles, Doubles and Twin rooms. There are also Family and Executive suites, together with luxury in cottages. Each of rooms has its own terrace that offers magnificent views over Lake Ihema. Visitors can relish the beautiful wonders of the sun setting over the distant horizon in their coziness rooms. Akagera Game Lodge rooms are stunningly ornamented with an African elegance touch and each room contains beds, satellite TV, a desk and chair. The interior design of each of the rooms has been prudently finished and tails African theme with lovely illumination. The trails to the rooms are well ignited accordingly allowing the visitors to simply march to their rooms at night. A extremely skilled and capable crew manages the cottage and there number one duty is to ensure that each client’s hopes are encountered during their visit.